Does Your Dog Eat Grass? In some instances eating grass might be an indication of boredom. If your dog has got a backyard to wander about in and not much to do in it then he may decide to engage in eating grass out of boredom. By providing him with regular exercise and mental challenges, or even another dog to play with, your dog may revert to eating grass out of boredom. If you notice your dog eating grass, make sure that you are spending sufficient time with him by taking him for walks or setting aside a specific time to interact and play with him. Sometimes the solution can be as simple as providing a few bones as an alternative of an interactive toy (check out www.tethertug.com ) I have one for our dogs and they absolutely LOVE it!). In addition, there are many more GREAT interactive toys guaranteed to keep your pup busy. I have found that as long as our dogs have toys, bones and a couple of interactive toys and each other, they will entertain themselves outside on nice days when I am home for hours! Some people believe that grass is a form of self medication if your dog has tummy troubles by turning to grass for relief. If the behavior suddenly starts – when it wasn’t there before, and your dog seems to be anxious, by chewing, swallowing while extending his neck and making swallowing motions and then vomiting afterwards a visit to the vet should be in order. Studies have found that it’s fairly rare that less than 25% of dogs vomit after eating grass and only about 10% showed signs of illness prior to eating grass. If you suspect that your dog has some type of stomach distress it could be something indicative and more serious like reflux or inflammatory bowel disease and would definitely require a trip to your vet. Most veterinarians will consider grass eating as a normal doggy behavior. Dogs don’t gain any real nutrition from grass but it may not hurt them as long as you are not fertilizing or applying pesticides or herbicides on the grass itself that they are consuming. You can help protect your dog if he is a grass eater by only using non-toxic products on your lawn. Be sure that when you take him to public areas like doggy parks or anywhere outside of your home environment to keep an eye out for signs warning that chemicals have been used on properties or grass. A great alternative is to provide a safe alternative if you have a grass eater by growing a grass or herb garden specifically for your dog to snack on! Make sure to keep the poison control number handy in the event that your dog ends up suffering from poisoning so that you call the 24/7 animal poison control hotline at 800-213-6680. I would love to hear your comments, feedback, stories and ideas. Does Your Dog Sleep In Your Bed? Back To School And Fido’s NOT Happy! 2 Responses to Does Your Dog Eat Grass? Our Max has been s sniffer from early on. At first he seemed attracted to certain weeds in the yard. We could be playing with a ball and he’d get distracted by the weed and divert to biting a piece off to chew on. In a different area where he spends more time, he’d sniff the ground, scratch a spot and then roll on it. More recently he’s taken to digging up a spot of grass and taking it to chew, even while we’re actively playing. I would say that if Max is consuming grass and not vomiting from it, it may be that he just enjoys some light “grazing” – perhaps he enjoys the taste of certain grasses. I would recommend that you not apply any fertilizers or weed killers to your property (at least that he has access to) if he is consuming it every so often. If he scratches a spot and rolls in it, that means he has found an appealing scent (to him!). We had a boxer years ago that rolled in cat feces – apparently it smelled good to him – but certainly, not us! 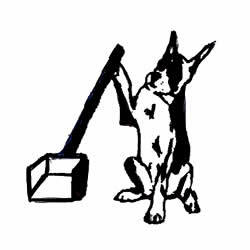 Scoops Dog Waste Clean Up Service is a member of aPaws: The Association of Professional Animal Waste Specialists. You can guarantee you will be getting the best service possible! © 2019 Scoops Dog Waste Clean Up Service, Inc.. All Rights Reserved.